You can create a Windows application which can access Outlook.com, Hotmail.com or Live.com account of a user via IMAP and SMTP without knowing the password of this user. Microsoft API for .NET Core does not support .NET Core and UWP. DotNetOpenAuth library was never ported to .NET Core or UWP. 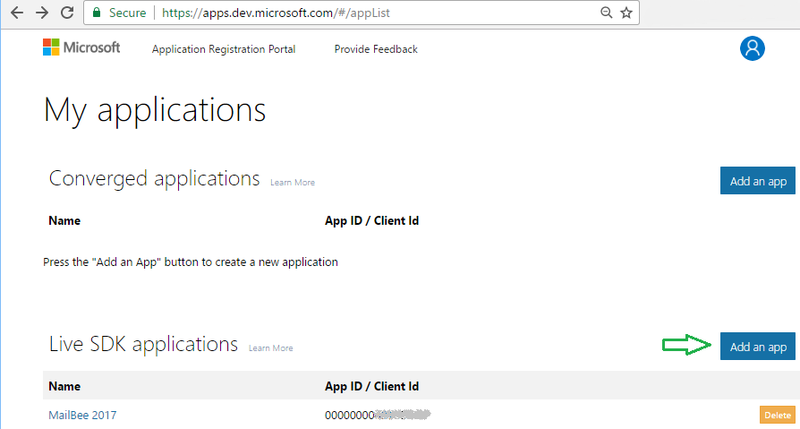 Create an application in Application Registration Portal. You may need to create an account there first. For OAuth 2.0, you should create a Live SDK application. Click Add an app in Live SDK applications section. Application ID (Client ID) and password (application secret) are there as well. Now create a console application in Visual Studio. Alternatively, you can open OAuthConsoleApps sample project and set MicrosoftEasyLogin class as startup object in the project properties. If you need WinForms version, check MicrosoftOAuthWinForms sample. Alternatively, you can use Add Reference to plug MailBee.NET.45.dll to your project. It resides in Assemblies/Framework/Extensions in case if MailBee.NET Objects is fully installed in the system, or use Browse if you have just the .DLL file. The sample does not use ExternalProviders library (like it's done in web apps version of OAuth 2.0 tutorial). The library uses ASP.NET Identity database as storage of access tokens and related data but we're not using that database in the sample for this article. Request authorization from Microsoft to access the scopes of IMAP/SMTP and the e-mail address (areas of authorization are called scopes). Do the authorization using Client ID and Client Secret issued by Microsoft to our application. This will open the browser window with Microsoft web page asking the user to authorize our application. If the user agrees, Microsoft delivers the authorization code by redirecting to the page which has this code in the URL. Then we request Microsoft server again to get the access token using the authorization code provided (the user will have to manually copy/paste the authorization code from the URL to our app). Use the access token and the e-mail address of the user (we assume it's know from other sources) to build XOAUTH2 key. Use MailBee.NET to connect to imap-mail.outlook.com (smtp-mail.outlook.com for SMTP) and log in using XOAUTH2 authentication method. The same mail server name works for all Microsoft services including Hotmail.com and Live.com domains. Do whatever needed in the user's mailbox (IMAP), or send an e-mail (SMTP). In subsequent topics we'll also add autodetection of the user's e-mail address, programmatic delivery of the authorization code from the browser to the application, and more. For now, let's stick to the simplest implementation. // This program shows how to get and use OAuth access token to check a user's inbox on Microsoft servers. // To run this program, select "MicrosoftEasyLogin" in Project / project's Properties / Application tab / Startup object. // live.com and other services). Offline access is not requested, the access token received is not persisted. // To get the token, it first starts the browser where the user is supposed to complete all the steps and get authorization code. // requests the access token from Microsoft server using the authorization code. // - Checks the user's inbox via IMAP on outlook.com mail server using XOAUTH2 authentication in MailBee.NET Objects. // outlook.com mail server can also be used for hotmail.com and live.com and other Microsoft domains. // (neither it reads them from any storage). // E-mail address can be of any MS domain: hotmail.com, outlook.com, live.com, etc. All MS services will work. // and don't forget to change the scope from "wl.imap" to "wl.imap,wl.emails" at least. parameters1.Add(OAuth2.Scope, "wl.imap"); // Works for both IMAP and SMTP. // Uncomment and set your key if you haven't specified it in app.config or Windows registry. // Logging is not necessary but useful for debugging.
' This program shows how to get and use OAuth access token to check a user's inbox on Microsoft servers.
' To run this program, select "MicrosoftEasyLogin" in Project / project's Properties / Application tab / Startup object.
' live.com and other services). Offline access is not requested, the access token received is not persisted.
' To get the token, it first starts the browser where the user is supposed to complete all the steps and get authorization code.
' requests the access token from Microsoft server using the authorization code.
' - Checks the user's inbox via IMAP on outlook.com mail server using XOAUTH2 authentication in MailBee.NET Objects.
' outlook.com mail server can also be used for hotmail.com and live.com and other Microsoft domains.
' (neither it reads them from any storage). Dim clientID As String = "Your Client ID, like 000000001A2B3456"
Dim clientSecret As String = "Your Client Secret, like 0a1b2c-3d4e5f"
' E-mail address can be of any MS domain: hotmail.com, outlook.com, live.com, etc. All MS services will work.
' and don't forget to change the scope from "wl.imap" to "wl.imap,wl.emails" at least. Dim userEmail As String = "user@outlook.com"
parameters1.Add(OAuth2.Scope, "wl.imap") ' Works for both IMAP and SMTP.
' Uncomment and set your key if you haven't specified it in app.config or Windows registry.
' MailBee.Global.LicenseKey = "Your MNXXX-XXXX-XXXX key here"
' Logging is not necessary but useful for debugging. This sample does not use async methods of MailBee.NET library. For async version, refer to MicrosoftOAuthWinForms sample. See Sample projects overview section for details. If you don't want to have the user to type their e-mail address manually, you can autodetect it, provided that you change the scope from wl.imap to wl.imap,wl.emails. You can also get other details of the user such as their name. The below is the code snippet demonstrating how GetUserData method can be called, and the code snippet which implements the method itself and its supporting methods and types. You may also need to add some using directives (Imports in VB) to make this code compile. Refer to OAuthConsoleApps\MicrosoftLogin.cs(vb) for the full list. // Be sure to have "wl.emails" in the requested scopes if you're using this method. Const LiveGetProfileUri As String = "https://apis.live.net/v5.0/me?access_token="
' Upgrade the escaping to RFC 3986, if necessary.
' Return the fully-RFC3986-escaped string.
' Be sure to have "wl.emails" in the requested scopes if you're using this method. Note that it's not required to get the e-mail address of the user on every run of the application for the same user. The e-mail address of the user will never change so you can save the result once and then re-use on future runs. Microsoft access tokens are short-lived, their lifetime is just 1 hour. We can enable "Offline mode" scope when requesting authorization and get the refresh token in addition to the access token. After that, the access token can then be renewed without user interaction. To persist access/refresh token data between sessions, any kind of data storage can be used. For instance, JSON-serialized text file. We need to implement this persistence manually as DotNetOpenAuth library does not provide any means for that (unlike Google APIs). Instead of GetAccessToken method from the original sample, let's introduce GetOrRefreshAccessToken. // Gets access and refresh token if grantedAccess is null, and returns the token data on success or null on failure. // modifying the input parameter grantedAccess) on successful renewal or null if the renewal is not required yet. // Get a new token or refresh an existing token? // Not needed in our tests, uncomment the next line if for some reason it's required in your case.
' Gets access and refresh token if grantedAccess is null, and returns the token data on success or null on failure.
' modifying the input parameter grantedAccess) on successful renewal or null if the renewal is not required yet.
' Get a new token or refresh an existing token?
' Not needed in our tests, uncomment the next line if for some reason it's required in your case. We read the stored access token data from a file (tokenFile must contain its filename) and pass it as authState object to GetOrRefreshAccessToken method which updates it if necessary. If the method returned null (Nothing in VB), the refresh is not needed and the method did nothing. Otherwise, the token data in authState object has been changed and the app must update the access token file to save the changes. After that, authState.AccessToken string can be used to pass OAuth 2.0 authentication against Microsoft server (just like in the previous samples). The original sample simply started the browser prompting the user to copy/paste the authorization code from the web page to the app manually. There are methods to automate this. Unlike Google APIs library which provides the built-in mechanism of authorization code delivery to the app, DotNetOpenAuth has no means for that. What options do we have? We can create a Form, put WebBrowser control there (actually, Internet Explorer), navigate it to Microsoft OAuth authorization page, let the user complete the authorization so that "code" parameter finally appears in the URL, and grab that code. Or, we can start a process to open the default web browser at Microsoft OAuth authorization page and start monitoring of system processes to wait till the moment when "code" parameter appears in the process name. With WebBrowser control, the user will have to fully log in their Microsoft account, including typing the e-mail address (not very convenient). This is because WebBrowser control environment is not the same as the default browser's environment where the user may have already been logged in. However, this method always works. With launching the default browser, the user won't have to type the e-mail address as they most likely are already logged in Microsoft account there (requiring less actions from the user). The password is still needed to be entered as Microsoft always requires that when the user grants access to an application (this is Microsoft-specific behavior, Google currently does not require that). However, this only works with Chrome and IE. Firefox does not show the current URL in the process name. It does not depend on whether the default browser puts URLs in its process name. The fact that the user has to type the e-mail address is not a big deal as the password is needed to be entered anyway (Microsoft requirement). If you're creating an app which will support both Microsoft and Google, you need to take care of Microsoft only regarding this issue. Google API hides authorization codes in its internals and the app receives access token right away. Unfortunately, it's not possible to simulate Google method of delivering authorization token to the application when dealing with Microsoft OAuth provider. Google API internally starts a local web server on localhost domain and Google web site redirects the browser there once the user completes the authorization process. But Microsoft does not allow for localhost server name. You'd need to run it on a custom domain name which would require to run your app as Administrator or perform specific Windows configuration (also under Administrator). You can display a form even in a console app, although it requires a bit more coding than in WinForms app (MicrosoftOAuthWinForms is an example). The main method is RunWebBrowserFormAndGetCode. In a console app, you need to run in on STA thread (WebBrowser control limitation), so there is StartTaskAsSTAThread helper method. And be sure to add reference to System.Windows.Forms. // in the current URL and return it to the caller. // Pros: WebBrowser control is always available. // Cons: the user will have to log in their Microsoft account in IE as it's the only browser supported by WebBrowser control. // but it's not required for Forms-based apps (there you'd simply place it on the form and that't all).
' in the current URL and return it to the caller.
' Pros: WebBrowser control is always available.
' Cons: the user will have to log in their Microsoft account in IE as it's the only browser supported by WebBrowser control.
' but it's not required for Forms-based apps (there you'd simply place it on the form and that't all). Note that in native WinForms apps, StartTaskAsSTAThread method is not needed. MicrosoftOAuthWinForms sample project demonstrates using RunWebBrowserFormAndGetCode method directly. In case if you still think WebBrowser control approach does not suit your needs, you can use the alternate approach of running the system's default browser. You can explore the full code #region "DefaultBrowser" section in OAuthConsoleApps\MicrosoftLogin.cs(vb) file to see how process monitoring can be implemented. Here, we just list the main method to let you get the idea. // while IE and Chrome are fine with that). // you can use any other unique string which is unlikely to occur in other https://login.live.com/oauth20_desktop.srf windows.
' while IE and Chrome are fine with that).
' you can use any other unique string which is unlikely to occur in other https://login.live.com/oauth20_desktop.srf windows. As you can see, this method also utilizes "state" parameter in OAuth URLs. Unlike WebBrowser control which is fully controlled by our app, running the default browser does not guarantee the user won't change the current tab (making it active) and this tab won't have the same URL like the one we need (for instance, if the user recently authorized our app and didn't close that browser tab). We need to somehow make sure that the currently opened browser tab was indeed initiated by our app. Moreover, by the current run of our app. For that, we set "state" parameter to some timestamp and then compare the browser process name (i.e. URL) if it contains that timestamp. OAuthConsoleApps\MicrosoftLogin.cs(vb) also shows some techniques to let the user bypass the standard method of waiting for the authorization code in the process name and type it directly in the console. For instance, if the current browser does not set the process name from the URL, the user will still have an option to copy/paste the code manually. This means the app must support two input sources simultaneously - from the browser process and from console input. For instance, the sample shows how to stop waiting for console input in case if the result became available by other means (from the process name in our case). The sample does this by sending [Enter] keypress event to the console. Unlike Google, Microsoft does not provide programmatic methods of revoking access tokens yet. The user must do that manually. See Obtaining User Consent for details. All the code in this tutorial is available in MicrosoftEasyLogin and MicrosoftLogin classes of OAuthConsoleApps project. WinForms version is available in FormMain class of MicrosoftOAuthWinForms project. All samples are available in both C# and VB versions. MicrosoftEasyLogin provides the very basic means of using Microsoft OAuth provider to check the user's mailbox via IMAP. MicrosoftLogin adds autodetection of the e-mail address, persistent storage of access token data, Offline mode and refresh tokens, automated detection of the authorization code via detecting it in the browser URL(manual user input is still available), sending e-mail via SMTP. MicrosoftLogin provides 2 methods of getting the authorization code: with WebBrowser control and launching the system's default browser in a separate process. FormMain class only offers WebBrowser control as the natural method for WinForms apps. FormMain class uses async methods which don't block UI during send e-mail or check e-mail operations with MailBee.NET Objects. Most of the operations can be canceled by hitting ESC or closing the app. OAuth calls involving DotNetOpenAuth library are still sync-only due to the lack of async versions in the current version of DotNetOpenAuth (can be worked around by putting the entire thing in a worker thread, however). All C# and VB samples discussed in this article (MicrosoftOAuthWinForms and OAuthConsoleApps) are shipped with MailBee.NET Objects installer and get installed into My Documents\MailBee.NET Objects\Samples\WinForms\NET 4.5 OAuth folder.